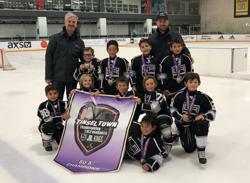 Thirty-nine teams from Northern and Southern California competed in this year’s Los Angeles Jr. Kings-hosted Thanksgiving Extravaganza Tournament, which was showcased from Nov. 22-25 at three Southern California rinks, with champions crowned in seven divisions. Thirty-nine teams from Northern and Southern California competed in this year’s Los Angeles Jr. Kings-hosted Thanksgiving Extravaganza Tournament, which was showcased from Nov. 22-25 at three Southern California rinks. Champions were crowned in seven divisions: 14U AA (California Wave), A (Gold Rush Hockey Club - Eddy) and B (Lake Tahoe Grizzlies); 12U AA (Jr. Kings) and A (Gold Rush Hockey Club - Elofson); and 8U A (Jr. Kings - Beebe) and B (Jr. Kings). Games were contested at Toyota Sports Center (El Segundo), East West Ice Palace (Artesia) and LA Kings Valley Ice Center (Panorama City). “We can’t thank all of the participating clubs enough for helping deliver what proved to be a great weekend of hockey to ring in the holiday season,” said tournament director Brian McDonough. “There was so much spirited competition in every division, and the camaraderie and sportsmanship displayed amongst all of the players, coaches, team managers and families was second to none. Division champions were awarded a banner, and all players on the championship teams received medals. Players on the runner-up teams in each division also received medals. Tournament vendors included Northwest Designs of California, Origami Owl, Aufeis Hockey, Custom Sports Banner, Teammate Robotics and Quality One Engravers. Kings Cove, Grimaldi’s Pizzeria, Mendocino Farms and Tin Roof Bistro served as restaurant partners for the event, and PSE Event Housing successfully coordinated all hotel accommodations for out-of-town teams visiting over the weekend. All 14U and 12U games played at Toyota Sports Center were streamed live via the Internet through LiveBarn.com. The Thanksgiving Weekend Extravaganza is part of the Jr. Kings’ Tinseltown Tournament Series. Pre-registration is now open for the Series’ remaining three events of the 2018-19 season: the Holiday Showdown (Dec. 27-30); Presidents’ Day Challenge (Feb. 15-18, 2019); and Carmen Starr Memorial Day Classic (May 24-27, 2019). For more information and to pre-register for any or all of the events, visit TinseltownHockeyTournaments.com.